You are a chicken. You think starting your own sourdough is too hard. You think only experts can do it. Not true! There is only one small thing that is the least bit challenging, and that is keeping your starter between 70 and 90º for a few days. Come on smarty. You can figure out how to do that right? Does your oven have a “proof” or “dough” or “rise” function? How about putting it in a cooler with a bowl of warm water, and changing the water from time to time? Maybe you can use an electric blanket set on low? Maybe it is just summer, and warm where you are? In my case, I used my home-built sous vide machine, but this being the only challenge of this recipe, and I leave it to you to figure out. You chicken. What the hell is sourdough anyway? It is a live culture. A mixture of yeast and bacteria that enjoy each other’s company. The yeast eat the starch in flour, releasing gas (which give baked goods their rise) and pooping out sugars, alcohol, and some interesting flavor compounds. The lactobacillus bacteria eat the sugars released by the yeast, and in turn poop out lactic acid (sour flavor) and some interesting flavor compounds. There is lots and lots and lots on the science and black art of sourdough all over the internets, so I won’t go into it. The point of this recipe is to be easy, basic, and give you a critical building block for several of my other recipes. This recipe is dead simple. Flour + water + time @ ~80º = sourdough starter. The vinegar is optional, and simply gives the bacteria the acidic pH environment that they prefer right from the start. Once they are established, they make their own acid (which is why sourdough is sour!). Wait , wait! Where the hell does the yeast and bacteria come from? From the world! From the air, from the flour, from the water! In fact, some people think that if you move a sourdough from, say, San Francisco, to say, Seattle, then start feeding it Seattle flour and Seattle water that in a few months it will no longer be a San Francisco sourdough. It will be a Seattle Sourdough. I like keeping my starter at 50% flour and 50% water. That way it makes calculating how much water and flour you are adding to a recipe dead simple. Combine ingredients in a jar, and loosely cover. Let sit for 2 days @ as close to 80º as possible. Ignore vigorous bubbling that may happen in the first day. This will subside. After 2 days, discard roughly half the culture, and add another 100g flour and 100g water. This is called a feeding. You may or may not notice some bubbling on day 3. Keep discarding and replacing half the culture every day until each feeding produces clear, vigorous foaming and bubbling of the culture. Ta-da! You have your own sourdough culture. When it is young, it isn’t likely to be very sour, but over the weeks and months it will sour up. 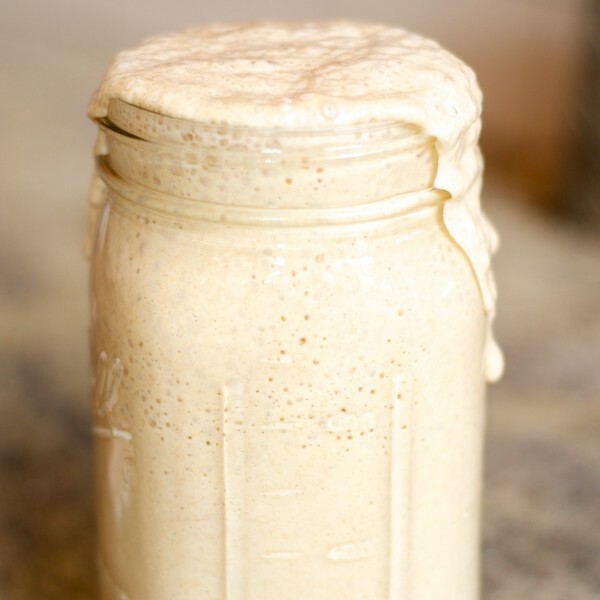 Once you have a sourdough starter, you can keep in the fridge, in a jar, and just feed it once every 3-4 weeks. When you intend to use some starter, feed it the night before, and leave it on the counter overnight to get it nice and vigorous. When you use some, just replace it with another addition of equal parts flour and water! Easy! This was written by cedar. Posted on Saturday, May 4, 2013, at 4:53 pm. Filed under Recipes. Tagged easy, ingredients, science!. Bookmark the permalink. Follow comments here with the RSS feed. Post a comment or leave a trackback. How long does it take to become “clear”? Any pictures of what I’m looking for? Pardon my need for clarification but Im new to sourdough. By “clear”, I just meant “obvious”. Nothing is literally clear. It can take anything from 2-7 days for a new culture to become vigorous. Thank you for this! I have made my own sourdough and various starters for years. My oldest was about 6-7 years old, but I killed it in a move out of state. I have made it in Arkansas, Virginia, Colorado, and now ‘starting’ a starter here in Port Orchard, WA. I learned something new today, about your adding the tsp of vinegar. Interesting. I leave my flour alone (dry), uncovered in a bowl by a breezy (screened!) window for several hours to pick up wild yeast, then begin my starter with the addition of water. I am looking forward to this newest batch. We will be living here for at least the next 6 years, so going to try again and keep this alive! Cheers! Ok, I admit it. I’m a chicken. Any reason that I couldn’t just come over to a friend’s house and steal some of that extra starter? That seems like such a fun way to share!